It was one of those days when the weather forecasters did not know it was a Wednesday as the rain hardly left us alone for the whole count and at times it was down right miserable. The Trumpeter Swan numbers went up a little this week, sadly the immature numbers did not do well. As team leader I am called upon when there to go out in the rain to count all birds, even though I order the other counters to do it, they just give me this funny look and wave. I even donned a pair of Dorothy’s sunglasses in the hope that they would take the hint but nothing doing. You just can’t get good help these days when I’m there. Trumpeter Swans made a good showing with the vast majority being up on Bench Road where 149 were had of our 188 total. Only 15 immature birds were counted all day and we hope this trend will change soon. The total numbers are up from the past couple of seasons and we would have to go back 3 years to see similar numbers, but it is early days and weather is still warm up north. Canada Goose numbers at 1422 were down a bit from last week and then you would have to go back 3 years to see these high numbers. Most migrants small geese had left with just 9 Cacklers being the only other species counted. 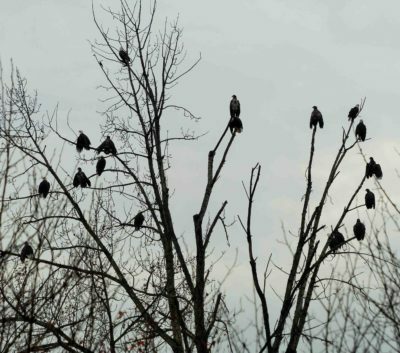 Eagle number were good with the bulk of our numbers being in the Cowichan River corridor where salmon carcasses abound for the picking. A couple of Coopers Hawks and 5 Red-tailed Hawks were added along with a single Peregrine Falcon. 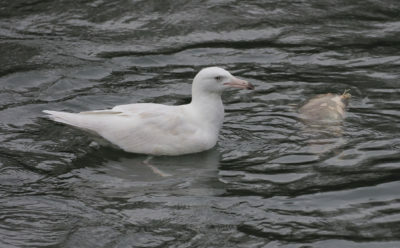 The rain really put the dampers on small birds and it was until the end of the day did we get any excitement to rave about when a immature Glaucous Gull was found on the Cowichan River feeding on dead salmon bit what were floating down the river. 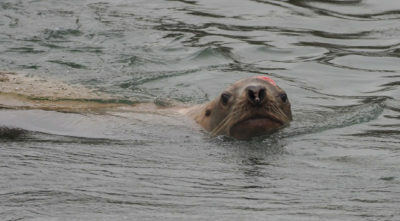 A sea lion was also up the river picking as well, it appeared to have a nasty scar on it’s head. 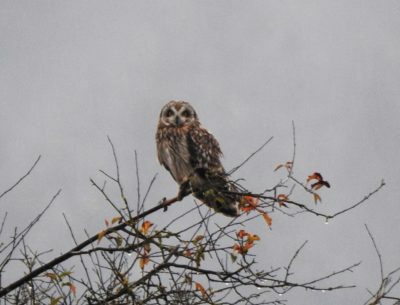 One of the team headed back down the bay after the count and found a nice Short-eared Owl. 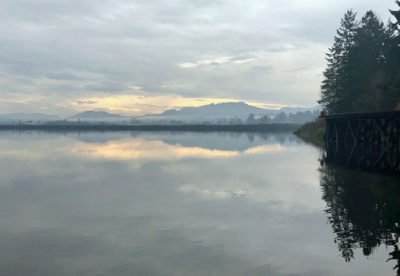 There are two pictures of the swans, what you see when you arrive and what you see through the camera when the picture is cropped a bit, what you don’t see is the rain and the poor devil out there counting. There is not much more I can say about the count except that I think everyone had had enough of the rain and were glad to head home.